Reaching your Bicheno accommodation at Cod Rock Point from Hobart……. Heading from the Hobart airport, follow the signs to the Great Eastern Drive – turning left at Sorell and heading through Orielton. We like to get to the very start of the Great Eastern Drive before we think we’ve earned a stop, so very often it’s at Orford where you could meet the former Olympic Diver Julie Kent at the gatehouse Café – just at the intersection on the bridge as you first arrive. We get takeaways, or if you have the time – you can see the extraordinary array of sporting memorabilia collected by her father – the local mayor Michael. Within a few minutes you are abreast of Raspins beach (Golf Club fairway 1 on your left and beach on the right), the spectacular, imposing in the distance. On a good day it takes your breath away and you realise you’ve arrived on the gorgeous east coast. You could miss Orford and go straight through to Triabunna instead – 5 minutes north – to the Visitor Centre. You might try the colonial Tea House, or the best fish and chips in the state from The Fish Van, outside the pub near the wharf – which is always abuzz with something going on such as the ferry to Maria Island, or a fisherman delivering his catch, or pleasure craft in and out. Northwards to Little Swanport and we’ve never found out why there are all those shoes on the fence outside the entry to Gum Leaves! Crazy. 10 minutes more and you come to Lisdillon, then a beautiful old stone building on your left as you approach Mayfield – and after the turnoff to Mayfield Jetty – the whole of the Freycinet Peninsula comes into view across Great Oyster Bay and what a view! We drive this road many times a month and that scene never fails to impress. 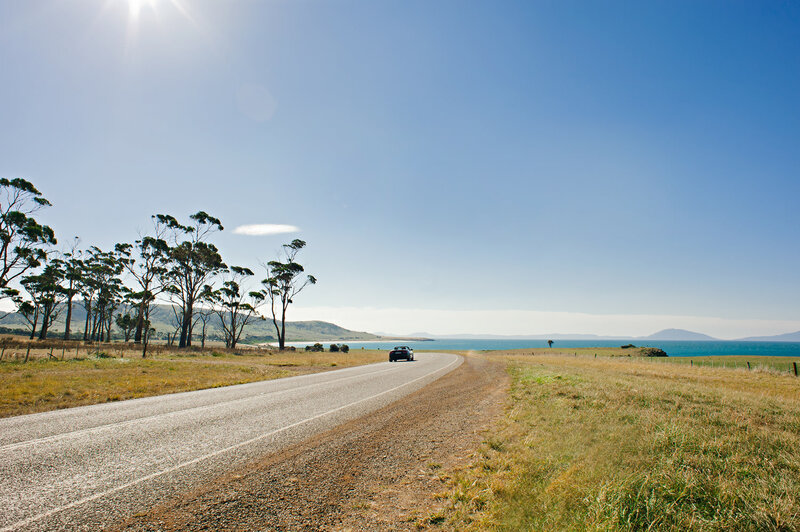 After the public camping on the right at Mayfield beach and past Avalon Retreat (you are at Rocky Hills) you have a twisting climb and then the road sweeps on a great left hand bend and you are looking over and another astounding view. A few more bends and you are at Spikey Bridge (on the left, a colonial stone masterpiece) and Spikey Beach on the right – a lovely stop indeed. In fact that’s the location of a lot of East Coast photos and ads. After that, Swansea – Nancy at Artifakt has great coffee and bites and Bob at the United Service Station does real service, at a station. Quite soon you are north of Swansea and there are vast Walnut orchards on either side of the road surrounding Belmont Estate – all owned by Webster Limited, a huge Australian agricultural company and then watch how the trees come right across the road to form a tunnel – just after the Wye River. You will next encounter a concentration of vineyards after the intersection of the Lake Leake Rd from Campbell Town. Starting with Milton (the Dunbabin’s) on the left, then Springvale on the right (the Lyne’s) and then Gala – on the left again at the hamlet of Cranbrook (The Grennhill’s). These are all terrific, personable cellar door experiences, please try any one of them. After the flat you wind up Cherry Tree Hill and after 7 or 8 kms of twisting road, you start your descent and after the major hairpin, the view is amazing as you have arrived at Devils Corner – take the right lane and drop in for fresh oysters or fish and chips from Freycinet Marine Farm, or wood fired pizza, coffee and treats from Tombolo – all amongst amazing architecture, a loo with a view and a pop up visitor centre. It’s an award winning piece of architecture around containers.